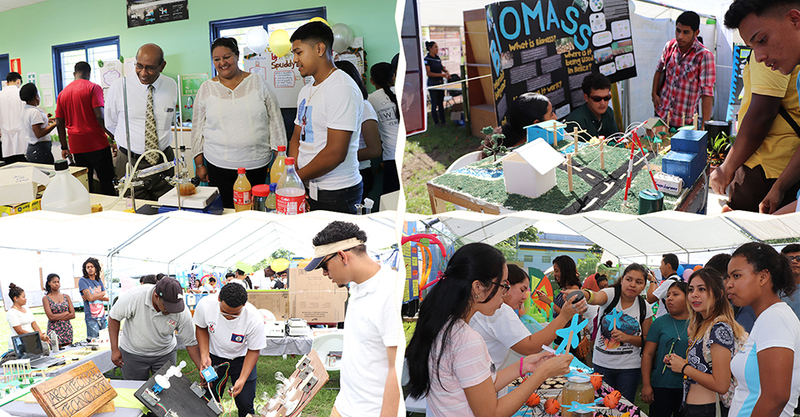 The Faculty of Management & Social Sciences (FMSS) of the University of Belize (UB) held three Marketing Expos to highlight student achievements and to reach the business, government, and other interested entrepreneurial stakeholders in Belize City, Toledo and the Capital, Belmopan. The tenth annual Marketing Expo for the Belize City campus was held at the Princess Hotel on November 22nd There were 35 booths; 21 from the “Principles of Marketing” and 14 from the “Small Business Management” classes. The guest Speaker was Mrs. Karen Lewis, the Director Retail & Small Business Banking at Scotia Bank. Prior to the Belize City event, the UB Punta Gorda campus held its business expo on November 17th at the district’s Central Park. Coordinated by Ms Cecilia Martinez full-time lecturer for Small Business and Ms. Shauna Sanchez - Marketing Lecturer. They were also assisted by Academic Chair Mr Tim Dami, Mr Glen Enriquez and Ms Gillian Flowers. Sixty students from the “Marketing” and “Small Business” courses took part in the expo which successfully demonstrated the theme “Embracing opportunities for growth through creativity, networking and perseverance.” The keynote address was delivered by Campus Administrator Roy Polonio who commended and encouraged the students for the excellent booths and presentations. While engaging the Punta Gorda community, the students distributed promotional items, including raffles and gifts as part of the marketing strategy. This spirit of entrepreneurship continued to the Central Campus in Belmopan. 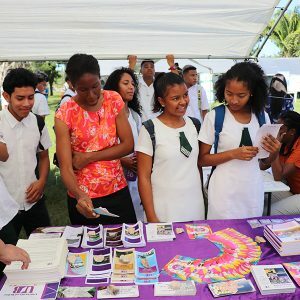 On the 23rd of November, businesses and students from the Capital City came to the Central Campus in Belmopan for another Marketing Expo which was designed to reach stakeholders and residents of the western region of the country. There were 37 booths on display. 11 stalls represented Marketing students at the Associate’s Degree level and 12 represented Small Business Management at the Bachelor’s Degree level. There was also participation from the UB Central Farm Campus; Our Lady of Guadalupe High and ten business institutions. The purpose of inviting a local high school’s participation was to introduce the students to entrepreneurship at the earliest age, provide visual stimulation to the business world and to become students of UB. The UB Small Business students were evaluated for creativity, promotion, distribution, customer information, banner, packaging, mission statement, student energy, customer service, professional attire, and communication skills. The Central Campus expo was coordinated by Audrey Pascascio (MBA), a Management Lecturer. 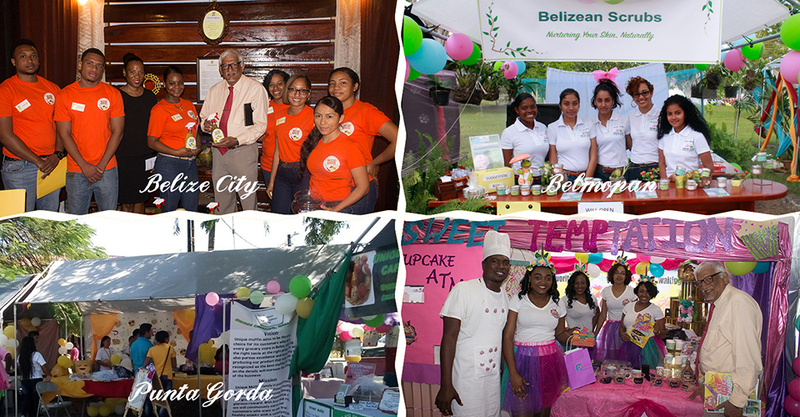 The University of Belize is grateful to all companies who gave donations towards prizes for these events. Professor Clement Sankat, President of UB, praised the students and their academic supervisors for creativity displayed at these events. He said that this augers well for the future of young students to start their own businesses when they graduate. He indicated that UB and the country of Belize need to find the “ways and means” to support them in the journey ahead. The Faculty of Science and Technology (FST) of the University of Belize (UB) held the 4th Annual FST Science Open Day on November 22, 2017 at the UB Central Campus. The expo involved participation of the FST’s Agricultural Department; Engineering Department; Science Department and the Math, Physics & Information Technology Department. The purpose of the event was to highlight the programs of UB, the work of our students and to get people interested in science from an early age. Students from primary, secondary and tertiary institutions were invited to attend the science fair. Stakeholders and partners from Government and the Non-Governmental Organizations (NGO’s) also participated. Students could see firsthand the technology and work available in this field. The theme for 2017 “Innovate, Experiment and Invest” was prominent as the 20 stakeholders that joined the student booths did not disappoint. 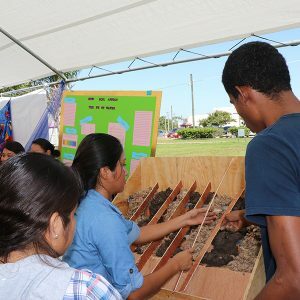 The Natural Resource Management program showcased GIS technology, maps and models that the students created in their courses while others displayed bioenergy and soil erosion. While students were showcasing very visible threats such as climate change, others went where the naked eye can’t see and into the beautiful world of microbes, amoebas and the less than appreciated world of invertebrates. The Chemistry and Physics Departments destroyed the idea that science is not fun. Students created a distillery and executed different chemical reactions that resulted in the silver mirror and another group demonstrated electrophoresis, a DNA separation technique. Others appealed to the palate by making ice cream using liquid nitrogen, and the science of other products including yogurt, wine and spirits; and another group created a hologram with coloured shadows. The Environmental Club demonstrated recycling techniques and the Math Club solved an equation that revealed mathematics can be fun. The IT department showcased apps and websites students developed and creations made using Raspberry Pi technology.